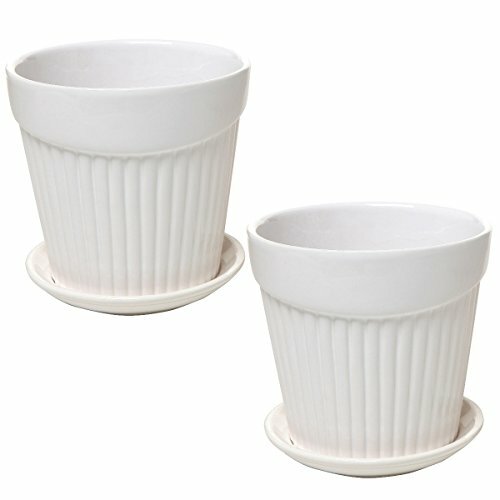 Bring eye-catching style and natural beauty to any space with this set of 2 small flower pots. Made of ceramic materials, each decorative planter in this set of 2 boasts a classic ribbed design and a modern, asymmetrical top border. This bold and stylish combination draws the eye and makes these flower planter pots ideal centerpieces or decorative accents for your home, office, deck, or patio. A hole set into the bottom of each plant pot allows the water in your plant's soil to drain into the attached saucer below, so your plant stays healthy and your table, counter, or deck stays dry. Ready to brighten up your space with bold style and natural greenery? Make this ceramic flower pot the new home for your favorite small plant today! Approximate Dimensions: 5" H X 5.25" in diameter. Small, ceramic planter with a ribbed design and an asymmetrical top border. The hole in the bottom is designed to allow the soil to drain, and the attached saucer catches the drained water and helps keep it off of your table, counter, deck, or patio. Perfect for bringing natural greenery and bright style to your indoor and outdoor spaces. Bloem Ups-A-Daisy Round Planter Lift Insert - 18"